Ogun State Chapter of the Peoples Democratic party (PDP) on Sunday conducted two separate primaries and elected two different candidates for the 2019 governorship election in the state. The Sikirulai Ogundele – led group conducted their primary at the Marque, Olusegun Obasanjo Presidential Library(OOPL), Abeokuta, with Hon. Ladi Adebutu emerging winner – sole candidate, garnering 2,369 votes out of the 2,669 accredited delegates. Capt. Mike Williams Hart (Primary Committee Chairman), Ms Barbara Aloma(Secretary), Emmanuel Ekpe (member), Anthony Agbetuyi (member) and Bukola Oyinkasola (member) from the National body, Abuja, conducted the primary that led to the emergence of Adebutu as a parallel candidate. Another group loyal to Senator Buruji Kashamu and where Engr. 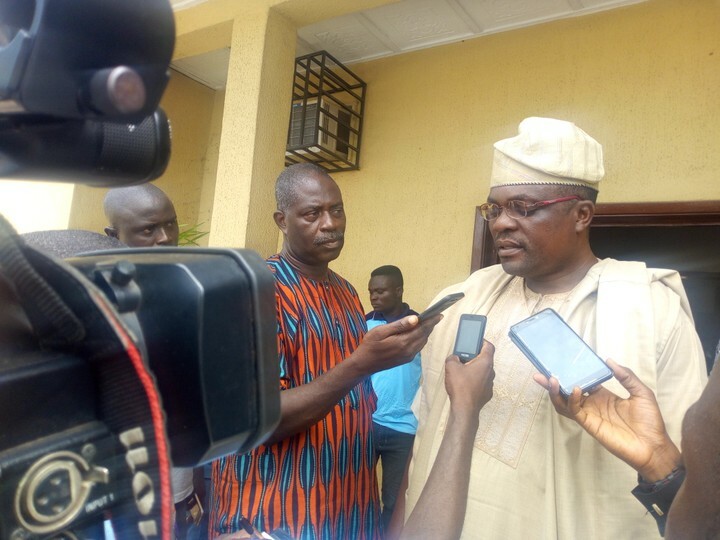 Bayo Dayo is the state executive chairman, had theirs at the PDP State Secretariat on IBB Boulevard, Oke – Mosan, Abeokuta with officials of the Independent National Electoral Commission (INEC) said to have been on ground to observe the exercise. At the end of the exercise with 1,994 accredited delegates, 1979 of them voted for Adeleke Shittu from Ijebu – Igbo, in Ijebu North Local Government Area of the state, to emerge the gubernatorial candidate of the Bayo Dayo group, after Fatai Adeyanju had stepped down for him. Speaking with reporters, Bayo Dayo maintained that theirs is the authentic primary conducted by the executive Committee deriving its authority from a valid court order since 2016. Meanwhile, Confusion and apprehension suffused the air of Abeokuta, the Ogun State capital, and other parts of the state over the planned governorship primary of the All Progressives Congress (APC), prompting five of the governorship aspirants – Senator Gbenga Kaka (Ogun East), Otunba Bimbo Ashiru(Ogun East), Prince Dapo Abiodun(Ogun East), Jimi Lawal(Ogun East) and Abayomi Hunye (Ogun West), to raise alarm on breach of security and breakdown of law and order in the state. The signed petition which was signed by the five aspirants and copies of which were sent to the Commissioner of Police, Director of State Security Service(DSS), Nigeria Security and Civil Defence Corps(NSCDC), the army and other sister security agencies in the state, the petitioners cited Hon. Semiu Akintade of Olorunda ward in Abeokuta North who they claimed has been kidnapped. They accused the state Chairman of one of the transport unions in Ogun State, of being behind the alleged security breach, stressing that even some security agents have been given lists their supporters for arrest on trump up allegations ostensibly to keep them out of circulation during the electioneering process. Six persons – Abdulkabir Adekunle Akinlade(Ogun West), Senator Gbenga Kaka (Ogun East), Otunba Bimbo Ashiru(Ogun East), Prince Dapo Abiodun(Ogun East), Jimi Lawal(Ogun East) and Abayomi Hunye (Ogun West), are in a keen battle for the APC governorship ticket in a primary that has been shifted till further notice. The petition reads: “We, the undersigned gubernatorial aspirants on the platform of All Progressives in Ogun State are constrained to write the petition on the unprofessional activities of some security personnel, who were actively engaged and poised to continue with their nefarious activities of intimidation, harassment, kidnapping and threat to life, such as the kidnapping of Hon. Semiu Akintunde in Olorunda Ward, Abeokuta North Local Government. “It is noteworthy, that some security personnel have been given a list of our supporters to be arrested and detained on trump up charges so as to remove them from circulation during the electioneering process.